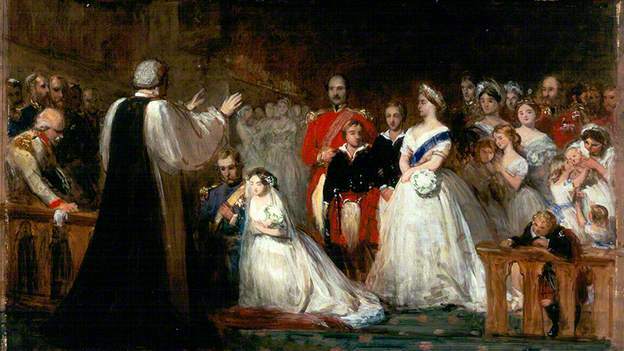 Surely you all know the wedding marches that normally sound at weddings, but do you know who their authors are or when they became popular for wedding ceremonies? The most famous is the so-called Wedding March of Felix Mendelssohn, the one that normally sounds when the bride advances towards the altar. It was composed in 1842 by order of one of his great followers, the king Federico Guillermo IV of Prusia. And it ended being part of the ballet A Midsummer Night’s Dream (based on the work of the same name of William Shakespeare) that the author had composed years ago. On the other hand, Richard Wagner’s Wedding March belongs to the Lohengrin opera and was composed in 1848. This is usually interpreted as the departure of newlyweds. Both melodies were made known when Queen Victoria, very fond of music and friend of Mendelssohn, chose them for the wedding of her daughter, Princess Victoria of Saxony, with the future Emperor Frederick III of Hohenzollern in 1858. As happened with her wedding dress which we talked about in a long time ago, her idea was imitated by the society of the time. Some wedding customs that have reached our days.